I love shredded chicken, and chicken itself is actually pretty good for you. Shredded chicken tastes great on salads, in sandwiches, in soups, on avocado toast, and more! It's a kitchen staple. But there is a serious problem with Shredded Chicken. Preparation. One option for your shredded chicken is to use something canned... doesn't sound great does it? Canned shredded chicken often comes with a lot of preservatives as well as sodium and is devoid of a lot of it's nutritional value. Another go-to I used to use was buying a rotisserie chicken and shredding that myself. But unfortunately rotisserie chickens are usually full of fat and butter, which is what keeps them so moist. After refrigeration you can often feel the coating on the chicken that is not so pleasant, and it still takes time. Plus I have never been a big fan of the process of shredding a rotisserie chicken. The last method that I used to opt for was a slow cooker. You could throw in some chicken with some broth and seasoning, leave it on high for 5 hours and voila! You can easily shred that chicken! But FIVE HOUR!? Who has the time? Plus chicken broth is usually full of sodium and preservatives! ugh! I wanted something that wasn't time consuming and that was HEALTHY. I finally found it! I got an instant pot, you guys, this is the best invention ever. These bad boys replace your rice cooker, slow cooker, bread maker and they are a pressure cooker. 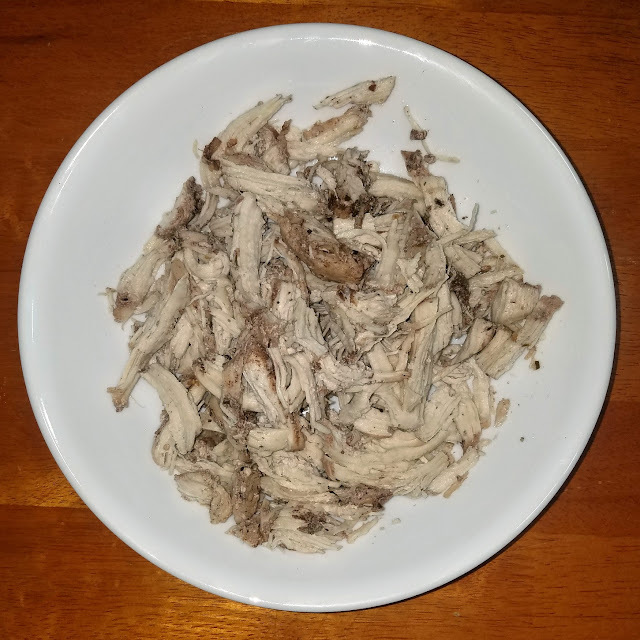 Making your own shredded chicken in the instant pot takes almost no time at all and is so fast! 1- Place all of these ingredients in the Instantpot. If you are using seasoning mix a little. 2- Set it onto the pressure cooker on high and cook for 20 minutes. 3- After cooking release the pressure. 4- Remove the chicken and shred. Some tips for this recipe. You CAN use chicken broth if you want instead of water. There will be water left in the pot after cooking, this is normal, just remove the chicken and shred. As far as adjusting for larger quantities, the water and seasoning work for up to 4 chicken breasts, but I would double them once you hit 5, or if your 4 are particularly large. I have put up to 3 Tbsp of seasoning with my two breasts before, and I just got a pretty strong flavor. It's all about how strong you want that flavor to be and how moist you want your chicken. Adjust to your needs and preferences.